BEIJING — Chinese meteorologists covered Beijing in snow Sunday after seeding clouds to bring winter weather to the capital in an effort to combat a lingering drought, state media reported. The unusually early snow blanketed the capital from Sunday morning and kept falling for half the day, helped by temperatures as low as minus 2 Celsius (29 Fahrenheit) and strong winds from the north, Xinhua news agency reported. 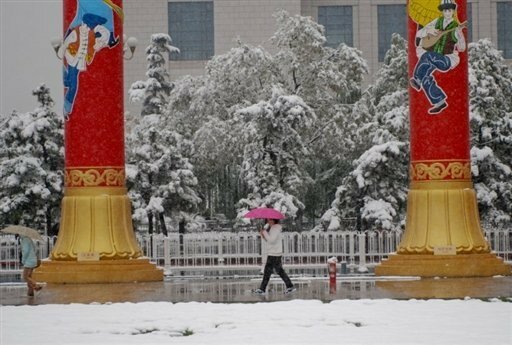 Besides falling in the northeastern provinces of Liaoning and Jilin and the northern province of Hebei, the eastern port city of Tianjin also got its first snow of the autumn, the report said. “We wont miss any opportunity of artificial precipitation since Beijing is suffering from the lingering drought,” the report quoted Zhang Qiang, head of the Beijing Weather Modification Office, as saying. Chinese meteorologists have for years sought to make rain by injecting special chemicals into clouds. Although the technique often gets results, a drought in the north of the country has continued for over a decade. Besides the snow, which the Beijing Evening News said was the earliest to hit the capital in 10 years, the cold weather and strong winds also delayed air travel from Beijing’s Capital Airport, while interrupting passenger shipping services off the coast of Shandong province in the east, Xinhua said.